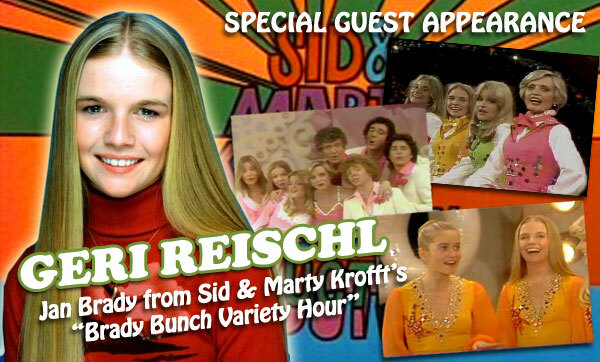 Welcome to the Classic TV Variety Show Blogathon and my post on The Brady Bunch Hour! While most of the other bloggers chose quality shows, I took the easy road and picked a bad one, because snarking on a bad show is easier and more fun than writing about a good one. But bad can also mean good, especially if you are speaking ’70s jive. As in “That Brady Bunch Hour is one baaaaad show!” TV Guide named it the fourth worst show of all time, awarding the top honors to The Jerry Springer Show. But BBH is good-bad; Springer is simply bad. 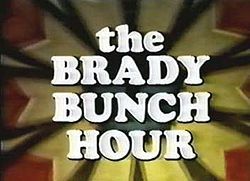 The pilot, which was broadcast Nov. 28, 1976, was called The Brady Bunch Variety Hour, and the eight episodes of the show broadcast from January to May 1977 were called The Brady Bunch Hour. When I refer to the BBH throughout this post, I’m referring to both. Two years after The Brady Bunch was canceled, Florence Henderson (Carol), Mike Lookinland (Bobby), Susan Olsen (Cindy), and Maureen McCormick (Marcia) made a guest appearance on Donny & Marie (see video clip below). Legend has it that ABC president Fred Silverman was watching, and a lightbulb went on above his head. “Get me those Bradys!” he ordered. BBH writer Bruce Vilanch (yes, the one from Hollywood Squares) says that the Partridge Family cast had already been invited to be the first fictional musical family to star in their own variety series but had declined. (See Vilanch’s interview at the bottom of the post.) Sid and Marty Krofft, those nuts who brought us such psychedelic ’70s Saturday morning fare as H.R. Pufnstuf and Lidsville, were signed on as producers. They were already producing Donny & Marie. One by one, the cast was approached to participate in the new venture, despite the fact that performing on a variety show requires different skills and training from acting on a sitcom. Only Henderson had the right experience for the variety format. Barry Williams (Greg), who had singing and dancing aspirations, was promised he would be the show’s star along with Henderson. For Christopher Knight (Peter), it was the opposite: He was promised he would hardly have to sing and dance at all, since he was terrified of both activities. Neither promise was kept. Classically trained Shakespearean actor Robert Reed, who for years complained that The Brady Bunch was drivel, was unexpectedly thrilled to be singing and dancing on a schlocky variety show. He knew he was terrible, but he was having a ball, and he tried his best. “Robert Reed worked harder than anybody,” recalls Marty Krofft in Love to Love You Bradys, a sparkly BBH coffee table book coauthored by Susan Olsen. Getting permission from Brady Bunch creator Sherwood Schwartz and Paramount, who owned the rights to the Brady characters, was an afterthought. Schwartz decided to step back, collect his meager royalties, and laugh about it, confident that the absurdly-premised variety show would fail before any real damage could be done. Before I go any further, I insist that you watch the opening of the pilot episode, which I have thoughtfully embedded below. From the very first moment, it’s awesome. Immediately there are clues that you’ve entered an alternate Bradyverse. You’ve got your Krofftette dancers doing high kicks and then diving into a swimming pool and performing synchronized water ballet. You’ve got your Brady Bunch theme music — played on the kazoo! There’s Mike, and Carol, and Greg, and Marcia, and… wait, who’s that? It’s Fake Jan! Even people who have never seen the BBH seem to know about the legendary recasting of Jan. After Eve Plumb turned down the opportunity to be a variety star, auditions were held to find a replacement, and Geri Reischl was cast — and she could actually dance and sing! You’d think her singing ability would be a good thing, but it just makes her stick out even more. 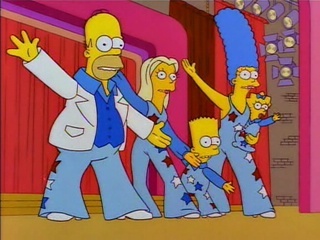 The Jan recast is brilliantly parodied in The Simpsons, in an episode in which the animated family stars in its own variety show, the Simpson Family Smile-Time Variety Hour. Lisa Simpson, who refuses to participate, is recast with a Geri Reischl lookalike. Fake Jan isn’t the only thing about these Bradys that’s different. The familiar Brady house is gone; at Bobby’s urging, the family has moved to a Malibu beach house in order to star in a variety show (the show we’re watching is a show within a show). Mike is no longer the strong patriarch we remember; he’s whiny and weak. When Jan moans, “Oh, why can’t I be dead?” (which she does repeatedly), Marcia’s face lights up and she says, “Yeah, why can’t Jan be dead?” In the real Brady universe, Marcia would be supportive of her anguished sister. True Bradys do not wish each other dead. Not surprisingly, there is no continuity from this Brady unreality to the later Brady shows (The Brady Brides, A Very Brady Christmas, The Bradys). It was all a bad dream, folks. Maureen McCormick looks dazed and blissed out throughout the entire series, much like the dreamy expression she wore when Marcia was in love with her dentist. According to McCormick’s memoir, she was high on cocaine the entire time they were filming the BBH. Poor Chris Knight really can’t sing, and this time, he can’t blame it on Peter’s changing voice. Alice has apparently traded heterosexual butcher Sam for the flamboyant, mustachioed Rip Taylor, her love interest on the BBH. In real life, Ann B. Davis and Taylor “loathed each other,” according to Vilanch. Cindy, the youngest one in curls, is now sporting something similar to a Farrah ’do, but less wavy. That must have caused some confusion when the real Farrah showed up as a guest star, along with her husband, Lee Majors. Speaking of guest stars, the show boasted some impressive ones: Tony Randall and Donny & Marie in the pilot; Milton Berle, Vincent Price, Charo, Tina Turner, and many others. Nothing I write could possibly describe the music, so I am just going to post a few of my favorite videos from the show. The first is The Brady Bunch meets The Wizard of Oz meets Car Wash. Just try to explain that one to anyone who wasn’t alive in the ’70s. Alice is the Wicked Witch; Greg is the Scarecrow; Peter is the Tin Man; Rip Taylor is the Cowardly Lion; and Marcia is Dorothy. And if this isn’t enough for you, there are clips from the series all over YouTube. See, what did I tell you? That Brady Bunch Hour is one baaaaad show. What happens when you cross the Bradys, The Wizard of Oz, and Car Wash? Barry tried, but he came off as quite laughable. I once heard Barry speak back when he first published “Growing Up Brady.” He showed video clips from the Brady Bunch Hour, and he mocked himself alongside the screen, doing the dance steps. He seemed to have a sense of humor about it.